As a leader of the Communist Party USA's Mexican American Equality Commission, Los Angeles based activist Rosalio Munoz, enjoys a level of political influence that would be envied by most U.S. Congressmen or Senators - if they had the slightest inkling of its extent. Munoz's primary job is to ensure that as many Mexican Americans as possible vote Democrat - to ensure that the Republican Party and conservative values in general , are consigned to the "dustbin of history". It is up to Munoz and his comrades to tilt the balance of power, in the border states particularly, to the point the Republicans become a permanent minority. Rosalio Muñoz has a long activist history. He was the co-chair of the Chicano Moratorium Against the Vietnam War, a Los Angeles protest march of 20,000 Mexican Americans in August 29, 1970. One year before that , Rosalio Munoz decided that if drafted, he would refuse to go fight in Vietnam. When he received his draft notice in the mail, Munoz, who had been UCLA's first Chicano Student Body President, started organizing in the Chicano community. His induction date coincidentally fell on Mexican Independence Day, September 16, 1969. He showed up at the draft board with around 100 activists and supporters. The draft board postponed his induction for a few months, and Munoz continued to fight at every point in the induction process. He refused to cooperate with the board, insisting on speaking in Spanish instead of English and eventually undertook a hunger strike. He did not go to Vietnam. In recent years Munoz has opposed the Wars in Iraq and Afghanistan, through his leadership of Latinos for Peace , an affiliate of the communist dominated United for Peace and Justice. But it is through organizing voters that Munoz has made his biggest impact. TUCSON, Ariz.  Communist Party leaders and activists met here to discuss plans to bring out the broadest possible Mexican American and Latino vote to defeat the ultra right in the November elections and to strengthen the CPUSA's work among this section of the population. The participants at the meeting, held in the Salt of the Earth Labor College on May 15-16, came chiefly from the Southwest and the West Coast. Lorenzo Torrez, chair of the Party's Mexican American Equality Commission, reviewed the Commission's work in the recent period. He proposed the organizing of a left-center Latino coalition to mobilize the progressive sentiments of U.S. Latinos. 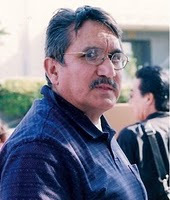 Rosalío Muñoz, CPUSA organizer in Southern California, reported on Latinos and the elections. He noted that the presidential race will be decided in key "battleground states." A number of these, such as Arizona, New Mexico, and Colorado, are states where Mexican Americans are concentrated, he said. Muñoz proposed that the CPUSA put out literature in both Spanish and English explaining what is at stake for Latinos in the upcoming elections. The 2007 Latino Congreso was designed partly to influence the 2008 election cycle. Rosalio Munoz and Joelle Fishman of the Communist Party USA Political Action Commission, were two of many communists involved in the Congreso. Some 2000 Latino leaders and activists from throughout the United States came together in Los Angeles October 5-9 to iron out a plan of action and a social justice program of issues for the 2008 elections with the goal of bringing out 10 million Latino voters that can play a decisive role in the presidential and congressional elections. and congressional elections in twenty states" that can change the political direction of the country said Antonio Gonzalez President of the Southwest Voter Registration project in opening up the 2nd National Latino Congreso convened by 10 national Latino organizations and hundreds of state and local groups from 22 states. "We are going to mobilize massively to reach record levels of Latino vote" on the key issues of immigration reform, the war, greening cities, health care and climate change declared Gonzalez. While recognizing that "today we don't have a critical mass to affect that change", Gonzalez said this can be achieved with "conscious thinking, planning and organizing" leading up to the 2008 elections." "We have big issues not only as Latinos but as citizens of the world", he concluded. I'm active in East LA Obama activities, outreach to the neighborhoods by phone and shoe leather is mushrooming Obama support, manana is here its time to get out the vote all day Super Tuesday. Why bother with risky guns and bombs when you can manipulate millions of voters into progressing your Marxist-Leninist agenda?